The Battle of Spangler's Spring occurred on the second day of the engagement of Gettysburg. 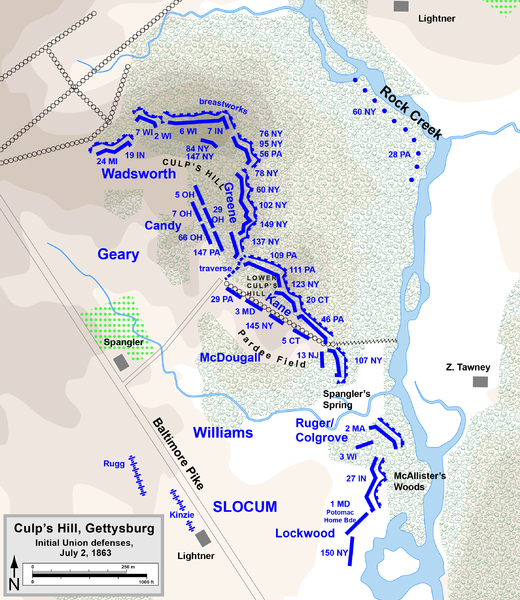 The second day, July 2, 1863, consisted of fighting at Devil’s Den, Little Round Top, the Wheatfield, the Peach Orchard, Cemetery Ridge, Trostle’s Farm, Culp’s Hill and Cemetery Hill, and involved at least 100,000 soldiers of which roughly 20,000 were killed, wounded, captured or missing. The second day in itself ranks as the 10th bloodiest battle of the Civil War—with far more casualties than the much larger Battle of Fredericksburg. The Battle of Spangler's Spring was contested during the second day of fighting at Gettysburg near a meadow and was bordered one end by Rock Creek and at its western edge by the Baltimore Pike and Powers Hill. This action was one of many smaller engagements that was fought throughout the three day Battle of Gettysburg during July 1-3, 1863. It was strategically joined with the nearby Battle of Culp's Hill and highly written about Battle of the Peach Orchard. 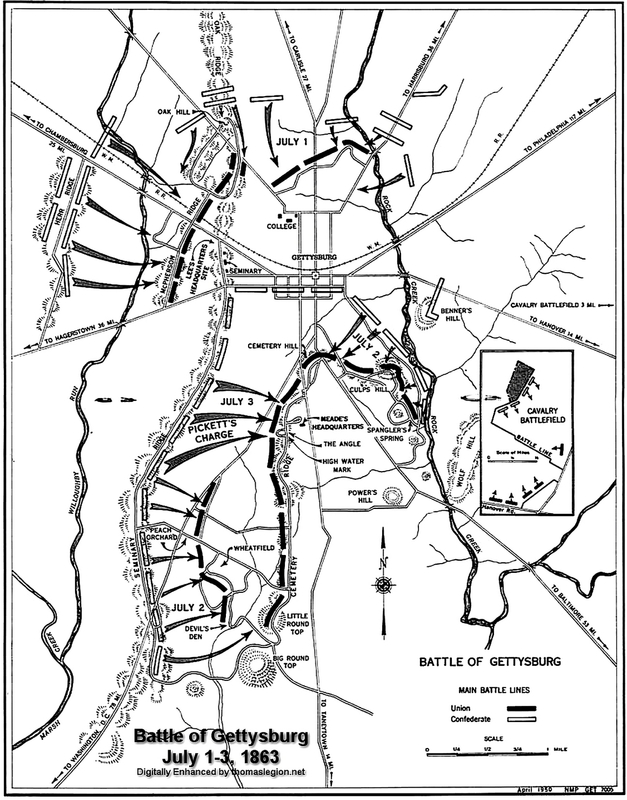 The battle, fought within the larger campaign and battle of Gettysburg, opened on July 2, 1863, and at the time that many other adjacent fields were being contested with cavalry, artillery, and the push of infantry. Spangler's Spring, an important field having good drinking water, was to be shelled by nearby artillery on Baltimore Pike and be the scene of bloody infantry charges, but the action, being a footnote by many authors, has been overshadowed by the well-know battles of the Peach Orchard and Culp's Hill. The map below shows Spangler's important location and gives an impression as to why each side would lock in a back and forth fight in hopes of holding the ground. During several charges many good men fell on this field while trying to take the location. By holding this position it would enable additional blue or gray clad troops to advance upon and press the enemy from Spangler's. We must charge and take the ground! barked one officer while sparing the details in a rather matter of fact tone, for he was informed that the field must be won and held so that command could then move onto, not one battlefield, but the adjacent battlefields. Years after being wounded during the battle of Spangler's Field, a private wrote that at Gettysburg he had no idea of what was going on at any of the surrounding battles, because of "the fact that shells rang and balls knocked down trees," he said, "and my ears were dulled and the smoke for a short time took my sight." Spangler's Spring was host to the likes of Gen. George Steuart, Gen. Edward Johnson, Lt. Col. Charles Mudge's fighting regiment, Gen. Walker's determined brigade, and Gen. Henry Slocum and his headquarters. Spangler's Spring at southern tip of Culp's Hill. Gettysburg NMP. 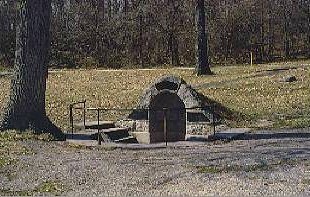 A natural spring that flows at the southern end of Culp's Hill, Spangler's Spring is one of the battlefield's most prominent landmarks and for many years prior to the battle it had provided water to quench the thirst of man and animal alike. Union troops of the Twelfth Corps occupied this area and constructed earthworks on the knoll north of the spring site. When these troops temporarily left the area on the afternoon of July 2, General Greene was forced to leave much of it unoccupied as his thin line of troops could not reach the section of works above the spring. Adjacent to the spring was a large meadow, bordered on one end by Rock Creek and at its western edge by the Baltimore Pike and Powers Hill where General Henry Slocum had established a headquarters. From this hill, Union officers and artillerymen could overlook the meadow to Rock Creek, which was effective for Union guns during the daytime, but Confederates from General Edward Johnson's Division decided to arrive in this area long after nightfall. Brig. General George "Maryland" Steuart's Brigade came upon these abandoned earthworks in the darkness and while Steuart's men were initially unopposed, Confederate units adjacent to his ran into Greene's men and fighting broke out. Steuart reformed his nervous men at the freshly captured works and sent the 10th Virginia Infantry forward as skirmishers into the black woods where they reached a stone wall bordering a small pasture. Darkness proved to be helpful to the Virginians but was also a detriment as the officers cold not see any Union positions and had little idea of where they actually were. "The regiment was compelled to change front to the rear and perpendicular to the wall," Steuart reported, "from behind which it repulsed a bayonet charge made by a regiment of the enemy." Threatened with another charge that may not be as easily stopped, "the brigade was ordered back to the works, where it was formed in line of battle, the First Maryland Battalion on the right and Tenth Virginia on the left, the North Carolina regiments still remaining outside the breastworks. This reconnaissance, as well as the reports of scouts and the statements of prisoners, gave us the assurance that we had gained an admirable position." Steuart's troops repelled another Union probe toward the Spangler's Spring area before 11 P.M., when the firing slowly died away and the night turned strangely quiet. Sensing that more Union opposition may lay in wait if he pursued his attack, General Johnson ordered Steuart and the rest of his command to halt and occupy the ground where they were while he requested reinforcements be sent to renew the attack the next morning. At 4 A.M. when Johnson's men were counter-attacked by returning Twelfth Corps troops, Steuart's soldiers found themselves trapped on the knoll. His right regiments, the 1st and 3rd North Carolina were pinned down by strong Union rifle fire coming from the summit and Union regiments that slipped into the woods immediately west of his position. Union artillery on the Baltimore Pike blasted the trees around his men, defenseless against this terrible fire. At the height of the fighting, two Union regiments- the 2nd Massachusetts and the 27th Indiana, were ordered to send skirmishers toward the knoll where Steuart's men were locked in. By the time the order was delivered to the commanders of the regiments, it called for a full scale attack. Incredulous, Lt. Colonel Charles Mudge of the 2nd Massachusetts told his officers, "Boys, it is murder. But these are our orders!" The attack was a disaster. As the two regiments charged into the meadow just south of the spring, they were hit on three sides by musket fire, not only from Steuart but Virginians of Brig. General Walker's brigade, who had arrived to support the left of Steuart's line. Both regiments lost heavily, including Colonel Mudge who was shot dead during the charge. 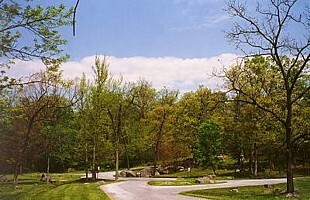 After seven hours of continuous fighting with no possibility of achieving any success, General Johnson ordered Steuart to pull his men from the positions here and reform with the division after re-crossing Rock Creek. For General Maryland Steuart, the fighting had taken a very toll on his command. His 1st Maryland Battalion had lost 189 soldiers out of 400 present and the two North Carolina regiments of his brigade, the 1st and 3rd, had both lost almost half of their numbers during the fighting. "My poor boys," the general said as his survivors crawled from the hill, "oh, my poor boys!" The earthworks were soon reoccupied by Union troops who spent the remainder of the day recovering wounded soldiers and burying the dead of both armies. "We have just concluded the most severe battle of the War," Colonel George Cobham, 111th Pennsylvania Infantry wrote to his brother on July 4th, "which has resulted in a complete victory on the Union side. The fighting has lasted two days and been desperate on both sides. All round me as I write, our men are busy burying the dead. The ground is literally covered with them and the blood is standing in pools all round me; it is a sickening sight." Battle of Spangler's Spring. Gettysburg NMP. (Right) Boulders and rocks like these near Spangler's Spring provided cover to some of General Steuart's Confederates during the fighting that morning. Photo Gettysburg NMP. 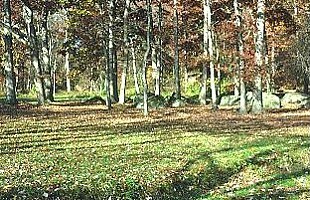 The forest of healthy hardwoods on Culp's Hill bore the scars of this battle for many years afterward, objects of keen interest to visitors. 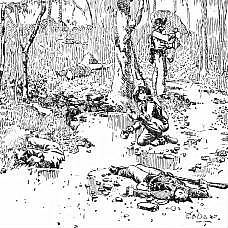 "The scene of this conflict was covered by a forest of dead trees," Henry Hunt wrote of Culp's Hill in the 1880's, "leaden bullets proving as fatal to them as to the soldiers whose bodies were thickly strewn beneath them." Located at the southern end of Culp's Hill, Spangler's Spring is adjacent to one of the few open pasture areas in this part of the battlefield. This natural spring provided a steady supply of clear water to refresh farmer and animal alike for many years prior to the battle. With throats parched after their long trek to Gettysburg, Union soldiers of the Twelfth Army Corps relished the water of Spangler's Spring as they gathered on the wooded slopes of Culp's Hill on July 2. These thirsty troops constructed log and earthen barricades on the hillside before they were marched away to support the crumbling Union left flank at the Peach Orchard. Later that same night, the Confederates of Brig. General "Maryland" Steuart's Brigade occupied those abandoned breastworks and also used the spring to fill their canteens. The Union counterattack early the following morning placed the spring in no man's land. Because it lay in front of the reversed line, the thirsty Southerners could not get back to it without running the risk of being shot by Union infantrymen who lay no more that 50 feet away. The spring site was reoccupied by Union troops late on the morning of July 3rd, finally denying its use to the Southerners. Legends sprouted soon after the battle that temporary truces were called between the sides so that men from both armies could fill their cups and canteens from this spring. This legend, no doubt, sprung from the stories told by some of the veterans who visited the battlefield years after the war when tales of cooperation between soldiers of both sides were popular. It is doubtful, when looking back at the historic evidence, that this actually occurred because of the location of the spring and the vicious fighting that raged around it. Yet, the legend of those temporary truces declared at Spangler's Spring is still very strong today. The fame of Spangler's Spring and its legend eventually led to damage from so many visitors who trampled its banks and destroyed the stone covers. To preserve the spring, the United States War Department constructed a permanent stone and concrete cover over it in 1895, with a small metal trap door to gain access to its waters. A metal dipper was provided for visitors to quench their thirst as the soldiers had done years before. This practice was halted soon after administration of the battlefield was assigned to the National Park Service. Due to the possibility of ground water contamination, the waters of Spangler's Spring are no longer available for public consumption. That morning, Gen. Robert E. Lee ordered attacks on both ends of the Union line. Lt. Gen. James Longstreet attacked with his First Corps on the Union left (Little Round Top, Devil's Den, the Wheatfield). Ewell and the Second Corps were assigned the mission of launching a simultaneous demonstration against the Union right, a minor attack that was intended to distract and pin down the Union defenders against Longstreet. Ewell was to exploit any success his demonstration might achieve by following up with a full-scale attack at his discretion. Ewell began his demonstration at 4 p.m. upon hearing the sound of Longstreet's guns to the south. For three hours, he chose to limit his demonstration to an artillery barrage from Benner's Hill, about a mile to the northeast. But despite this demonstration, Ewell did not hold the attention of Army of the Potomac commander, Maj. Gen. George G. Meade. Meade was occupied with the fierce fighting on his left flank and was scrambling to send as many reinforcements as possible. He ordered Slocum to send the XII Corps in support. It is unclear whether he ordered the entire corps or instructed Slocum to leave one brigade behind, but the latter is what Slocum did, and Greene's brigade was left with the sole responsibility for defending Culp's Hill. Greene extended his line to the right to cover part of the lower slope, but his 1,400 men would be dangerously overextended if a Confederate attack came. They were only able to form a single battle line, without reserves. Only three of the five brigades of Union troops that were dispatched from the hill saw combat. The remainder of Geary's division marched down the Baltimore Pike and missed a key right hand turn. By the time they realized where they were, the crisis on the Union left flank and center had subsided. Around 7 p.m., as dusk began to fall, and the Confederate assaults on the Union left and center were slowing, Ewell chose to begin his main infantry assault. He sent three brigades (4,700 men) from the division of Maj. Gen. Edward "Allegheny" Johnson across Rock Creek and up the eastern slope of Culp's Hill. The brigades were, from left to right, those of Brig. Gen. George H. Steuart, Col. Jesse M. Williams (Nicholl's Brigade), and Brig. Gen. John M. Jones. The Stonewall Brigade, under Brig. Gen. James A. Walker, was occupied with Union cavalry on Brinkerhoff's Ridge to the rear. As the fighting started, Greene sent for reinforcements from the I Corps and XI Corps to his left. Wadsworth was able to send three regiments, and Maj. Gen. Oliver O. Howard on Cemetery Hill was able to send four—altogether 750 men, who served as Greene's reserve and help to restore dwindling supplies of ammunition. On the Confederate right flank, Jones's brigade of Virginians had the most difficult terrain to cross, the steepest part of Culp's Hill. As they scrambled through the woods and up the rocky slope, they were shocked at the strength of the Union breastworks on the crest. Their charges were beaten off with relative ease by the 60th New York, which suffered very few casualties. Confederate casualties were high, including General Jones, who was wounded and left the field. One of the New York officers wrote "without breastworks our line would have been swept away in an instant by the hailstorm of bullets and the flood of men." In the center, Nicholls's Louisiana brigade had a similar experience to Jones's. The attackers were essentially invisible in the dark except for brief instances when they fired, but the defensive works were impressive, and the 78th and 102nd New York regiments suffered few casualties in a fight that lasted four hours. Steuart's regiments on the left occupied the empty breastworks on the lower hill and felt their way in the darkness toward Greene's right flank. The Union defenders waited nervously, watching as the flashes of the Confederate rifles drew near. But as they approached, Greene's men delivered a withering fire. The 3rd North Carolina "reeled and staggered like a drunken man." Two regiments on Steuart's left, the 23rd and 10th Virginia, outflanked the works of the 137th New York. Like the fabled 20th Maine of Col. Joshua L. Chamberlain on Little Round Top earlier that afternoon, Col. David Ireland of the 137th New York found himself on the extreme end of the Union army, fending off a strong flanking attack. Under heavy pressure, the New Yorkers were forced back to occupy a traversing trench that Greene had engineered facing south. They essentially held their ground and protected the flank, but they lost almost a third of their men in doing so. Because of the darkness and Greene's brigade's heroic defense, Steuart's men did not realize that they had almost unlimited access to the main line of communication for the Union army, the Baltimore Pike, only 600 yards to their front. Ireland and his men prevented a huge disaster from befalling Meade's army, although they never received the publicity that their colleagues from Maine enjoyed. During the heat of the fighting, the sound of battle reached II Corps commander Maj. Gen. Winfield Scott Hancock on Cemetery Ridge, who immediately sent additional reserve forces. The 71st Pennsylvania filed in to assist the 137th New York on Greene's right. By the time the rest of the XII Corps returned late that night, Confederate troops had occupied some of the Union defensive line on the southeastern slope of the hill, near Spangler's Spring. This caused considerable confusion as the Union troops stumbled in the dark to find enemy soldiers in the positions they had vacated. Gen. Williams did not want to continue this confused fight, so he ordered his men to occupy the open field in front of the woods and wait for daylight. 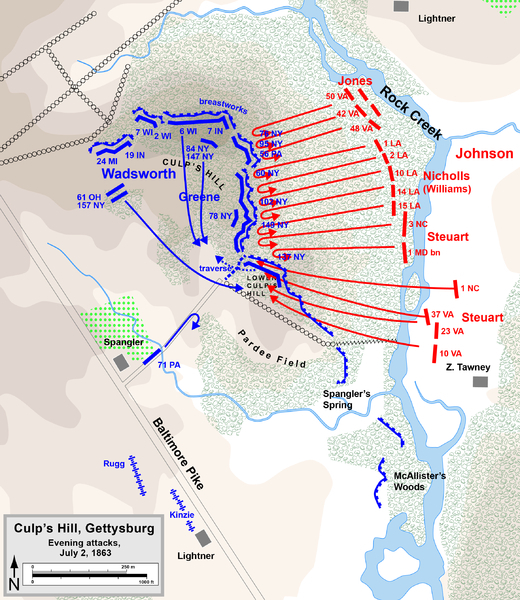 And while Steuart's brigade maintained a fragile hold on the lower heights, Johnson's other two brigades were pulled off the hill, also to wait for daylight. Geary's men returned to reinforce Greene. Both sides prepared to attack at dawn, the third and final day of the engagement. 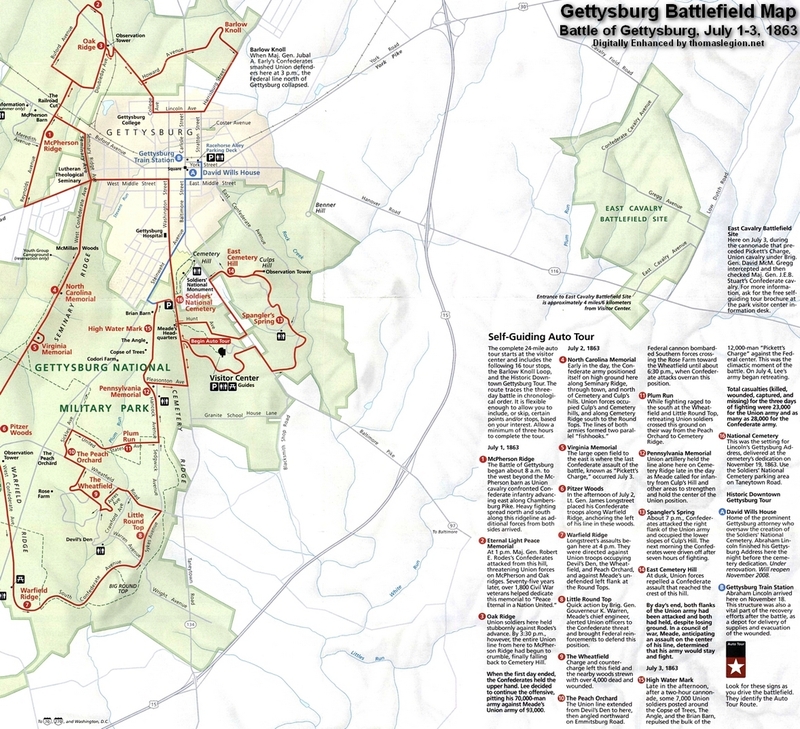 Sources: National Park Service; Gettysburg National Military Park; Civil War Trust, civilwartrust.org; Hap Jespersen, cwmaps.com.